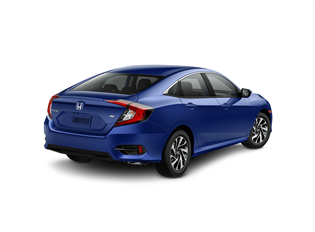 Markham, ON (January 11, 2018) – Honda Canada adds a Special Edition (SE) sedan trim to the already diverse Civic lineup to celebrate the nameplate's 20 years as best-selling car in Canada, with an MSRP of $22,390. The Civic is a key pillar to Honda Canada's success and accounts for nearly 40 percent of the brand's annual sales. The Honda Civic is proudly built at the company's manufacturing facility in Alliston, Ontario - by Canadians, for Canadians. "The Civic embodies the challenging spirit of Honda and our commitment to delivering innovative products of the highest quality, durability and value. We are thankful for and deeply humbled by the loyalty and trust that our customers have placed in Honda and the Civic in the past 20 years," said Jean Marc Leclerc, Senior Vice President of Sales and Marketing, Honda Canada Inc. "The 20-year success of the Civic has led to the organic growth of a passionate and dedicated ‘Civic Nation'; a community made up of Canadians from all walks of life, connected by their common love of the Civic." The Civic is Honda's longest-running automotive nameplate and its highest selling model globally. Its Canadian introduction came in 1973 when the Civic was heralded for its refined driving dynamics, quality construction and world-class fuel efficiency, despite selling only 747 units the first year. The revolutionary CVCC (Compound Vortex Controlled Combustion) engine debuted in Civic and cemented Honda's place in history as a leader in powertrain innovation. "Being built at our Canadian manufacturing facility for 30 years and achieving this remarkable 20-year sales milestone has certainly cemented the Civic's importance in Canada," continued Leclerc. "The Civic's longstanding Canadian production history is a direct reflection of the knowledge and experience of the more than 4,000 highly-skilled manufacturing associates at HCM." The Special Edition trim was developed in celebration of the Civic's 20-year sales dominance and is intended to build upon the nameplate's perfect marriage of styling, performance and packaging, by offering features Civic buyers want, including 16" aluminum-alloy wheels, leather steering wheel, Smart Entry with push button start, remote engine start, rear lip spoiler and a unique ‘SE' emblem. • More than 1,286,000 Civics were sold in Canada in the past 20 years. • Cumulative Canadian sales of Civic since 1973 reached 2,045,169 in December 2017. • The Civic has been Canada's best-selling passenger car for 20 consecutive years. • Production of the Civic (three-door) began in 1988 at Honda of Canada Mfg. (HCM) in Alliston, Ontario. • To date, more than five million Civics have been built at Honda's manufacturing facility in Canada. • More than 85 percent of all Civics sold in Canada in 2017 were built in Canada. • In 2015, HCM became the global lead plant for the tenth generation Honda Civic, marking the first time a global lead plant had been located outside of Japan.